This is of course late, but there originally was a good reason for it. Your birthday was last Monday, but we were supposed to have your party on Saturday (yesterday) and I was planning on including some pictures/anecdotes from it but, unfortunately we had to cancel because you came down with some bug that left you feverish and cranky. It's kind of funny because you rarely ever get sick and you did for your birthday party. Boo. Anyway, you're officially TWO. That's crazy. When you're not driving me completely crazy with your independence, you're actually really entertaining and it's been so fun to see the kind of person you're becoming. You're this whole little person full of personality and your own ideas about E-V-E-R-Y-T-H-I-N-G! It still seems like yesterday you were this tiny peanut and now you're this kid that's funny, stubborn and so loving. This past year has brought about many changes -the biggest of course coming most recently with the arrival of your baby sister and seeing you with her and interacting with her reinforces how far you are from that peanut we first got to meet in 2011. Happy second birthday munchkin. You continually amaze me and prove that a person's love can continue to grow exponentially. I love you and can't wait to see what this next year has in store for us! Wow, time has flown by. I really meant to post a birth announcement on here, but you know how things go (and my track record for posting in a timely manner is pretty poor)... but, I thought I'd give a quick update on how things went and how they've gone this past week. I decided last Tuesday to go ahead with the scheduled induction and was given a 5:30 am call time for Wednesday, April 27th. So after putting Callan to bed and telling him when he woke up the next morning I would be gone to go get his baby sister, we went off to bed (after doing things like setting up the bassinet, packing a bag, etc. Nothing like waiting until the last minute). Huge and I got up and headed to the hospital before everyone was up, but it seems like many other people had headed there the night before as well and lots of babies were being born. After waiting for 2 hours, we were told we'd have to come back later that day once things quieted down. I guess having a non-emergency induction really bumps you to the end of the line! So off we went to grab some food and run some errands before baby #2 arrived. We finally got the call that afternoon and headed back to the hospital around 2. By 2:30 I was checked in, hooked up and ready to go. And then that's when the waiting happened... Getting induced is B-O-R-I-N-G! Huge took lots of naps and I caught up on facebook and emails. After a few hours of pitocin, I got an epidural as my doctor figured I'd progress pretty quickly after I got my bag of water broken. It was definitely a little odd to get the epidural before I needed it, but I wasn't going to chance not getting one in time. Unfortunately, that may have slowed down my labor a little bit. I was having pretty regular contractions before that and then once I had the epidural, they started to space out or become uneven. Speaking of uneven, I had absolutely no feeling in my right leg (and found out later that I had lots of it on my left side!). Anyway, after the contractions picked up and I got my epidural fixed we just waited until I was ready to push. At around 1:15 am, it was time and after a few minutes of pushing Nora Kensie was born -all 7 pounds, 8 ounces and 19 inches of her. And the first immediate thing we all said was, wow, she looks like Callan! Poor baby girl already has fallen into her big brother's shadow. And this is Callan. Clearly a strong family resemblance. Callan came on Thursday to see her (and me) and the first thing he wanted to do was hold Nora and give her a big kiss. He's been unbelievably sweet to her. 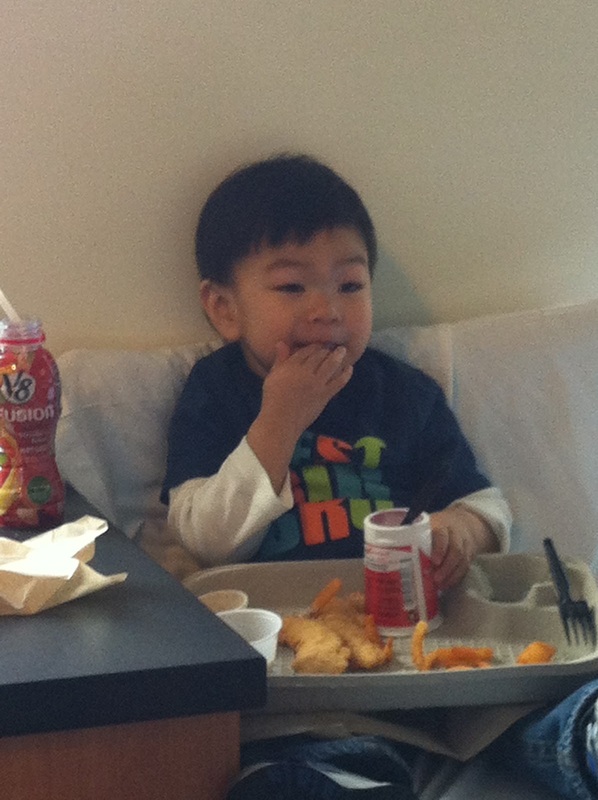 Of course, he was just as excited about the fries from the cafeteria that he got to eat at 10 am! Unfortunately, Nora's stay at Prentice (Northwestern) wasn't as smooth as I'd have liked. She was fine during the day, but during that first night the nurses detected some breathing issues. They were finding that her oxygen levels were dropping and that she was having problems breathing. We had noticed that she was kind of wheezy, but were told that it was pretty common for babies that don't spend a lot of time in the birth canal to have excess amniotic fluid that isn't squeezed out, but it should clear on its own. Unfortunately after having a couple of desaturation episodes, she was admitted into the NICU for observation. As hard as it was to have her down there, I'm glad she was able to get the extra monitoring and care (the NICU nurses are fantastic. The post-partum nurses are too, but I just loved our NICU ones). After a few days (and an extra day at the hospital), it was determined that it is feeding related, so we just need to take extra care to watch her when she's eating and immediately after -make sure she burps properly and doesn't have too much reflux. It isn't the end of the world, but it makes those middle of the night feedings that much harder since we can't just lay her back down after she eats (thankfully she's a quick eater!) and we need to stay up with her for another 30-60 minutes after. Other than that, things have been pretty smooth sailing. We are doing great. Physically I feel so much better than I remember the first time around (and I thought I had a really easy recovery then). Nursing has also been so much easier than last time and since we're not starving the baby she's been really content. My milk came in around day 2 (?) and Miss Nora has been a little piggy. She got discharged from NICU on Sunday and we had a pediatrician appointment on Monday and she had already surpassed her birth weight! With Callan it had taken him a couple weeks, but Nora was able to do it in just a couple of days. I don't know if it's because we've already gone through this or if our expectations were lowered substantially, but (knock on wood) it really hasn't been too bad so far. I have also been really lucky to have Huge not travel for awhile. Huge's mom was also in town and she cleaned the house, organized and cooked and of course, Adelia has been an enormous help. I think it's helped Callan's transition as his routine stayed mostly in tact and he still gets that one-on-one time with her. Of course, it also helps that Callan pretty much loves on Nora all the time. He's already trying to teach her to high five, likes to rock and push her on the swing and of course always wants to hold her. The sight of these two just melts my heart -there's just too much cuteness. I can't wait to watch them grow up together.